November 14, 2017 by Dominik Żmuda 2 Comments The editorial content on this page is not provided by any of the companies mentioned, and has not been reviewed, approved or otherwise endorsed by any of these entities. Opinions expressed here are the author’s alone. See our disclosures for more info. Booking Star Alliance award flights is getting more difficult by the day. United Airlines MileagePlus no longer allows you to be creative with your desired routing and instead forces you to accept the flight combinations their website shows – if you customise your trip further using the multi-city option, you will most likely be charged more miles. Other decent Star Alliance frequent flyer programs include Singapore Airlines KrisFlyer and Avianca LifeMiles. However, KrisFlyer just announced an award chart devaluation and also imposes massive fuel surcharges on award tickets. Avianca LifeMiles does not impose fuel surcharges, but it is nearly impossible to redeem miles nowadays. Thankfully, there still is one decent Star Alliance frequent flyer program – Air Canada’s spun-off Aeroplan. Aeroplan has a generous award chart, very flexible routing rules, the most competent agents, and does not charge fuel surcharges on a number of airlines. AMEX Membership Rewards points transfer instantly to Aeroplan. SPG Starpoints take a number of days to transfer, however keep in mind that for every 20k SPG points you transfer you will receive 5k bonus miles – that means 20k SPG points = 25k Aeroplan miles. Many frequent flyer programs charge “fuel surcharges” as hidden fees on award tickets. Fuel surcharges are carrier-imposed charges which range upwards of $200 USD one-way. Famous frequent flyer programs that charge fuel surcharges are British Airways Executive Club, Lufthansa Miles & More, and Singapore Airlines KrisFlyer. United Airlines MileagePlus and Avianca LifeMiles do NOT charge fuel surcharges, which is why when you redeem those miles you won’t usually pay more than $100 in taxes/fees per direction of travel. When redeeming Aeroplan miles, you will want to redeem your miles for travel on the airlines listed above – it will save you a ton of fees! In addition, LOT Polish Airlines fuel surcharges are very low, so you can feel free to redeem on LOT and will still save a ton of fees. $425 USD for a “Free” Mileage Ticket using Aeroplan?! $346 USD for a “Carrier Surcharge”?! 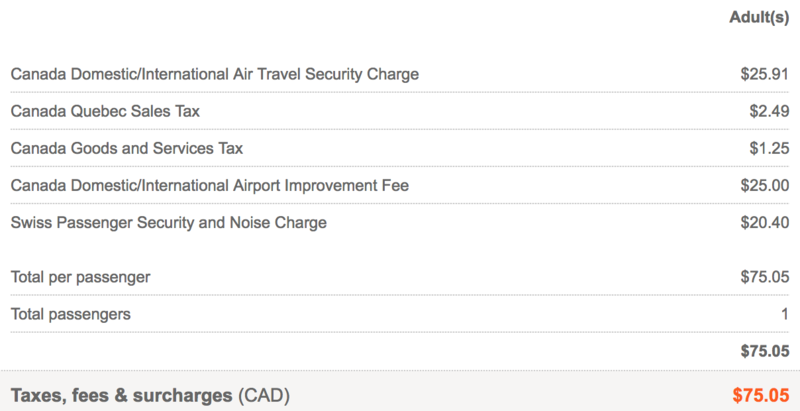 In addition to the $440 CAD, are the regular taxes/fees that every frequent flyer program imposes on award tickets. The major difference is that some frequent flyer programs impose fuel/carrier surcharges while others don’t. Total Price: Only $59 USD – No Fuel Surcharges! 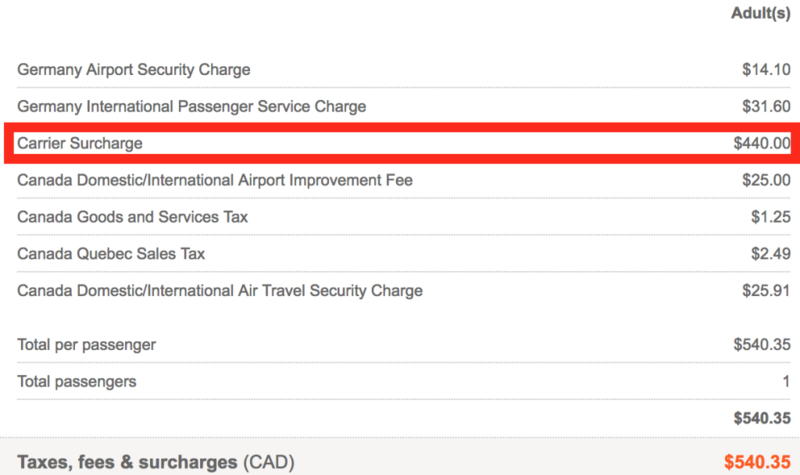 Don’t Pay Fuel/Carrier Surcharges when using Aeroplan miles! The only fees you end up paying are the normal taxes/fees which everyone has to pay – no matter which miles are used. The major difference are the massive fuel/carrier surcharges. A stopover is a stop in a city for more than 24 hours on the way to your destination. If you are stopping somewhere on the way to your destination for less than 24 hours, this is a layover and NOT a stopover. You can have as many layovers as you’d like (they all just have to be under 24 hours). In the above case, we are flying from Seattle to Munich with a stopover in London on the way to Munich and a stopover in Paris on the way back to Seattle. You can have zero, one, or two stopovers on a round-trip award ticket. You can stay in any of these three cities (London, Munich, Paris) how long you want – there’s no time/day limit. In the above case, we have flights from Seattle to Munich and then from Paris to Seattle. However, we do NOT have a flight between Munich and Paris as that is our open-jaw. You can take advantage of open-jaws by adding in more destinations by purchasing separate flights. Aeroplan is by far my favourite frequent flyer program. With a generous award chart, very flexible routing rules, instant transfers from AMEX points, competent agents, and no fuel surcharges on some airlines, it is one of the best frequent flyer programs. The only downside to Aeroplan is that it does NOT display all possible connections when searching for flights online. My advice for this is to search flights on United.com and then simply call Aeroplan to book – give the agent the flight numbers and they should be able to book them. If you want to book multi-city trips with stopovers and open-jaws, you will have to call Aeroplan – but don’t worry, because the agents are very competent. Who is going to take advantage of Aeroplan’s flexible rules and no fuel surcharges soon? This is very interesting,but the flight options are terrible for a trip we wish to book using Aeroplan points to fly across Canada this year. I found better flights on United but when I phoned an Aeroplan agent she told me I could not book a United flight using my Aeroplan points. She said that the only flights I could use my points for were the ones offered by Aeroplan. So how do I get better flights on United, using my Aeroplan points for a domestic flight? You cannot fly within Canada via the US.